When you read the words, “Jewish Holiday Cooking,” what is your first thought? Brisket? Matza ball soup? Maybe if you’re in a dessert mood, apple cake or doughnuts? The answer most likely does not come from the dairy case, since holiday meals typically favor meat over milk. But there’s an exception, and that exception is Shavuot, which begins this year on June 3. Jews customarily celebrate Shavuot, the Festival of Weeks, with rich, butter-laden, cream-filled menus. Trays of blintzes; silken cheesecakes; casseroles of baked ziti; cookies and brownies made with real butter, this is the Jewish cook’s nose-thumbing to margarine and rice milk. For dairy menu inspiration, I turned to Cooking Inspired (Feldheim), a new cookbook edited by Estee Kafra, who oversees KosherScoop.com, an exhaustive online exchange of recipes from Shabbat and holiday classics to, you guessed it, inspired, exotic flavors. The recipes on the site—200 of which she selected for the cookbook—come from Kafra as well as several contributors, some notable kosher chefs and bakers like Levana Kirschenbaum and Paula Shoyer. A complete dairy meal—lunch or dinner—could start with Avocado Panzanella Salad, feature Grilled Vegetable Skewers as a side to Cedar Plank Salmon with Maple Glaze or Provencal Roasted Vegetable Lasagna (a gourmet tweak of baked ziti!) 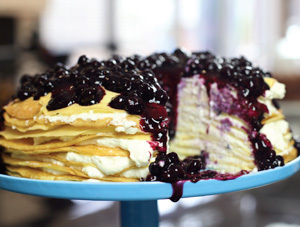 and finish with No-Bake Blintz Cake, an eye-popping, luscious stack of blintzes topped with blueberries in a thick, sweet sauce. Hag sameah and b’teyavon! 2. Roasted Vegetables: Gently toss together the onion, zucchini, eggplant, fennel, oil, rosemary and pepper in a bowl. Spread evenly on a rimmed baking sheet. Roast in the center of the preheated oven for about 35 minutes or until tender and golden. Transfer to a bowl; stir in the sun-dried tomatoes, olives and capers. Set aside. Reduce the oven heat to 350°F. 3. Meanwhile, in a large pot of boiling salted water, cook the lasagna noodles for 6 to 8 minutes or until tender but firm. Drain well. Arrange the noodles in a single layer on damp tea towels. 4. Cheese Filling: Stir together the ricotta, eggs and pepper in a bowl. 5. Arrange 3 noodles in the bottom of a 13″x 9″ baking dish. Spread 1/4 of the tomato sauce over. 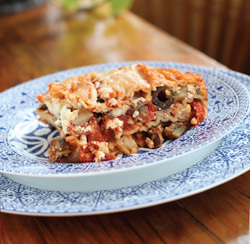 Top with 1⁄3 of the vegetables, 1⁄3 of the ricotta mixture and 1⁄3 of the goat cheese. Repeat the layers twice more. Layer with the last three noodles and the last quarter of tomato sauce. Sprinkle the mozzarella over evenly. Cover loosely with foil. 6. Bake in the center of the preheated oven for 30 minutes. Remove the foil. Bake, uncovered, for 25 to 30 more minutes or until bubbly and the top is light golden. Let the lasagna rest for 10 minutes before cutting into servings. 1. 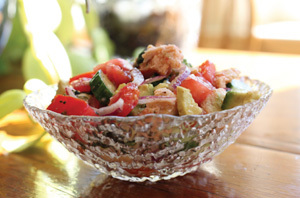 Toss together the bread, tomatoes, cucumber, red onion and avocado in a bowl. 2. Dressing: Whisk together the vinegar, garlic, mustard, salt and pepper in a separate bowl. Slowly, in a gradual stream, whisk in the olive oil until emulsified. Pour the dressing over the salad, tossing gently until evenly coated. Let stand at room temperature for 20 minutes. Toss again, add the fresh basil and serve. Cedar planks are available at Home Depot and many major supermarkets. Serves 6. 2. Place the first 6 ingredients in a saucepan; bring to a slow boil. 3. Place the salmon in a shallow dish. Reserving about 1/4 cup, pour the glaze over the salmon. Marinate at room temperature for 30 minutes. 5. Place the cedar plank directly on the middle rack in the oven and bake for 8 to 10 minutes or until the wood is lightly toasted. Remove the plank from the oven. While still hot, brush with a thin coating of olive oil. 6. Remove the salmon from the marinade; discard the marinade. 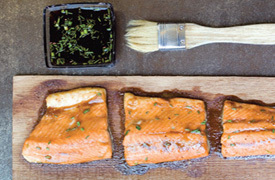 Place the salmon directly on the hot plank and then in a shallow roasting pan. 7. Roast in the center of the preheated oven for 20 to 25 minutes, basting with the reserved 1/4 cup during the last 10 minutes or until the fish flakes easily with a fork. Glaze the fish with the reserved sauce. 1. Cut a variety of your favorite vegetables into bite-size chunks. Thread onto skewers, alternating colors and variety. 2. In a bowl, whisk together 1/4 cup olive oil, 1 tablespoon balsamic vinegar, 1 teaspoon each of dried basil and oregano and 2 cloves garlic, minced. Season to taste with salt and pepper. 3. 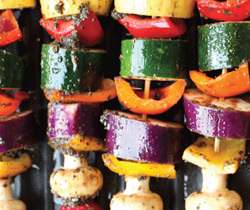 Grill the skewers over medium heat, turning often and basting with the balsamic dressing, for about 6 minutes or until charred and softened. Note: Of course, choose the vegetables you and your family prefer, but don’t forget about more seldom used ones such as pearl onions (which will need to be blanched), eggplant, fennel, radishes, zucchini, peppers and cherry tomatoes. All the components can be made up to two days ahead, but it is best assembled the day it is served. Serves 10-12. 1. Crêpes: Whisk together the eggs in a large bowl. Add the remaining ingredients and whisk vigorously until there are no lumps and the batter is smooth. 2. Lightly brush some oil in a 9-inch nonstick skillet set over medium-high heat. Pour 1⁄3 cup of the batter into the center of the pan, swirling the pan to spread it evenly. Cook on one side until the edges begin to brown and bubbles appear on the surface. Loosen the crêpe from the side of the pan and flip over. Cook for 2 to 3 minutes, pressing down on the crêpe with a spatula to avoid burning. When done, flip onto a prepared plate. Repeat with the rest of the batter. 3. Filling: Place all of the ingredients in a large mixing bowl and mix until combined. 4. Blueberry Sauce: Bring the blueberries, sugar and water to a boil in a small saucepan. Add the dissolved cornstarch and bring to a boil again, stirring often. Remove from heat, stir and let cool to room temperature. 5. Assembly: Place one crêpe on your serving dish, spread a layer of filling all over the crêpe, going all the way to the edges. Repeat with 10 more layers, ending with a crêpe. 6. Pour the blueberry sauce over the top of the cake immediately before serving.